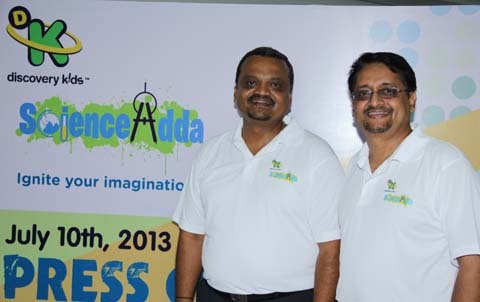 ScienceAdda Learning Innovations, a Bangalore-based venture, has signed a licensing agreement with Discovery Kids, operated by Discovery Networks Asia-Pacific, to build an experiential learning platform through educational pavilions and travelling road shows for children. This is a first-ever tie-up of its kind, with both entities coming together to launch a series of educational initiatives aimed at de-mystifying science in everyday life. Facilitated by Mumbai-based licensing firm Dream Theatre, this association seeks to create a new avenue for children to experience science through a hands-on- minds-on approach. The Discovery Kids-ScienceAdda modules will use simple experiments to explain how science comes into play in everyday life. With a primary target audience of 7- to 15-year-olds, Discovery Kids-ScienceAdda Pavilions are built as suitcase model that take learning science right up to the customer’s doorstep. The objective is to experience science in a story telling format whereby children will be able to relate to real life scenarios. The initiative will allow kids to explore scientific themes like Sound, Light, Water, etc., in a fun way through audiovisuals and experiences. In simple terms, the mantra is ‘Hands On = Minds On’. Branded merchandise will also be sold at the pavilions. The Discovery Kids–ScienceAdda collaboration will also launch Hobby Kits, which engage children through Do-It-Yourself Kits (available with a one-year subscription), group assignments and participation in science competitions. Another extension to the venture are the Science Conclaves which are aimed at bringing science teachers, researchers and students onto a common platform for interactions to aid a better understanding of science.